3/15/13 -- Mass Effect Cowboy Bebop shout-out - Man it's been so long since I updated I don't even have Dreamweaver installed anymore, I'm using a damn text editor. Anyway, been playing the greatest game ever made, which I'll be honest I didn't like much after the ending was released, but it has fully redeemed itself with the newly released DLC, Citadel. I'm talking bout some Mass Effect 3 over here. Steve Blum was good enough to take the opportunity to do a Cowboy Bebop shoutout during the DLC, and I have uploaded it for your pleasure. 2/5/09 -- Restoration - I re-uploaded cowboybebop.org and started paying the hosting fee again. It seemed appropriate since they're making a live action version. This way people searching for information about "that new Keanu Reeves film", they might accidentally find out about an awesome anime instead. 12/17/08 -- Your Neutralness, it's a beige alert. - Live action Cowboy Bebop has been officially confirmed. If I don't survive, tell my wife hello. 12/17/08 -- Bogus adventure. - Ain't it cool news has an interview with Keanu "Stone Face" Reeves about the upcoming live action adaptation of Cowboy Bebop. So its looking more and more as though that, barring Keanu's succumbing to his long struggle with Tetanus, live action Cowboy Bebop is go. Boo. 8/1/08 -- Party on, dudes? - Sorry I'm a bit late with this update, surely everyone has heard by now that there is a live action Cowboy Bebop on the way. This news has been reported in several places and for now seem legit. To be perfectly honest, this news doesn't really fill me with glee, because I expect it to be miscast, misdirected, and all around screwed with in ways not befitting it's legend. The first sign that perhaps Fox doesn't quite get Cowboy Bebop is that Keanu Reeves is set to star as Spike. Thanks to SXS for the article on the casting. Remember SXS? 3/4/08 -- Are you missing the dearly bereft? - A funny thing, memory. Today I was listening to some MP3s I had around, and one of them was Last Stop: This Town by The Eels. That song always irrevocably reminds me of Cowboy Bebop, thanks to what I still consider one of the best ever Cowboy Bebop music videos, Flash Before Your Eyes by Cosmic Mule. Which led, naturally, to me watching that video again. There are so many lines in that song that fit so perfectly with the series - "Will you take me where you're going if you're never coming back?" "You're dead, but the world keeps spinning." Watching that video reminded me once again what an iconic and beautiful series Cowboy Bebop is. Some say that it "shows it's age", and while I've always known that some parts of the animation are less than smooth (but hey, I've noticed that in Miyazaki films, too), I don't think it's dated at all. While thinking about the series, and how much I still love it after all this time, it suddenly hit me: Cowboy Bebop is 10 years old this year. April 3, 1998 was the date the first episode of Cowboy Bebop was shown on Japanese television, and the episode they played was "Stray Dog Strut." (CB, being sort of "half OAV", didn't get all of the episodes show on the original airing, some appeared only on the DVD, until WOWOW aired all the episodes starting later that year). Happy 10th birthday, Cowboy Bebop. Anyone have any good ideas for something the site should do in celebration? I don't think my email form works anymore, but you can reach me at jazzmess at gmail dot com if you'd like to suggest something. Also, I've fixed the download links, to videos and such. Hopefully they all work now. 2/14/06 -- Happy Fun Luck Candy, part 2 - An article and interview with Watanabe about his visit to Houston's Museum of Natural Science may be found here. Apparently, the reason he picked Houston was because it's the home of cowboys. Ha! He's charmingly vague as usual, but he does discuss topics such as Spike's hair color (dark green, just like I've always told you looneys), Spike's relationship with Faye (just that Spike likes her, but pretends not to... this I've always known), the importance of music in his works, his future projects, and whether Spike is truly HUGE SPOILER or not (well, he doesn't answer that one directly, he just more or less says "if I answered that, people would hate me"... which sort of does answer the question). He also mentions that one day there could be more Cowboy Bebop... "maybe." However, I feel compelled to point out that Japanese love saying "maybe" in answer to questions in order to avoid saying "yes" or "no", so that "maybe" could mean just about anything. So don't get your hopes up. More importantly, don't start anymore retarded internet rumors. Shinichiro Watanabe will be present for a "Bonus Event" at the Japan Culture Day at Houston's Museum of Natural Science. The event will take place Sunday, February 12 Noon � 4:00 p.m. in the museum's Grand Hall. Cultural events will include taiko drumming, face painting, ikebana and more. All of which will be free. Museum guests will also be able to get autographs from Shinichiro Watanabe betweem 1:00 and 3:00 p.m.
Hrm, the exclusive bonus material might be cool at least. Incidentally, if you live in or near Houston, Shinichiro Watanabe will be speaking today at 6:30pm at the Houston Museum of Natural Science. Sorry for the short notice, I didn't think of mentioning it before. 9/4/05 -- Knock Knock Knockin' on Heaven's Door - Well, KoHD premiered tonight, and they were pretty light on the edits, as far as I could tell. There was the predictable editing of Faye boobie (during the shower scene), but surprisingly Electra boobie was deemed acceptable. The end credits were also set on double speed. The most surprising "edit" of all, though, was more of an un-edit. Rather than the lame "Cowboy Bebop TEH MOVIE LOLZ", they actually put up the original title, Knockin' on Heaven's Door, with the kanji and everything. I thought that was pretty cool, myself. When I get the time, I'll do a page for the edits in the film; I'm sure there are some that I'll only see when I watch the broadcast version side-by-side with the uncut version. Another thing I noticed tonight, which has nothing to do with CB but is neato nonetheless, was the commercial for the Escaflowne movie. Now, I'm not a huge fan of the movie ( great visuals, poor plot), but I am a great fan of the Esca TV series. The nifty thing about the commercial was that a song was used which was not on the movie soundtrack, but was on the TV series soundtrack. Which means that someone at Adult Swim had imported that soundtrack to be able to use it. Just another reminder that despite all the jokes, the folks at AS really are anime fans. 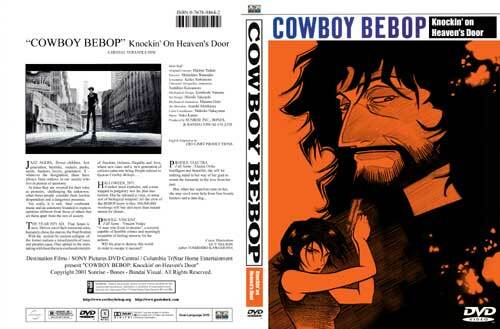 8/23/05 -- Cowboy Bebop: The Movie television premiere - KoHD will premiere on Adult Swim on September 3rd at 12:00am EST. 7/18/05 -- Feeling like I've been punched in the gut - Ouch, J.K., you really know how to hurt a girl. Disillusionment and grief aside, I actually do have some Cowboy Bebop news. There's a new trailer out for the Cowboy Bebop game. Bit creepy seeing them in 3-d, innit? Bullet-time is so overused nowadays, but it could still be a good game. 7/15/05 -- Spike Spiegel and the Half-Blood Bounty Head - I actually knew this a few weeks ago, but thanks to those who reminded me to post it: Cowboy Bebop is back on the airwaves Monday through Wednesday at 1:30am and 4:30am, EST. 7/6/05 -- Er, Ok, how about a moderate beating for bandwidth pirates, then. - Apparently, the 'overages' on CowboyBebop.org were a mistake, so it's back up. Also, you can now preorder Cowboy Bebop Remix vol. 1 from Amazon.com and Rightstuf.com, so whee. 7/5/05 -- Death to bandwidth pirates - It appears that someone has been siphoning off bandwidth from CowboyBebop.org, and as a result it's reached overages despite the fact that it's only 5 days into the month. That's a rather amazing feat considering I get 40gigs of bandwidth transfer and I no longer host MP3s. Not sure what happened as I can't get into the control panel at all. I'm happy it wasn't Jazzmess, but I'm still ticked off. This, people, is why I tell you not to hotlink, but does anyone listen to me? Nooooo. Anyhoo, in other news, there's now a working site for the CB PS2 game which contains screen shots and the like, though it's in Japanese. Thank you to the various sources who reported this to me, especially Skittle. According to the Anime News Network, August 8 is the date for the Japanese release, while the North American release is set of October. 5/31/05 -- Remix release date - Bandai now has a release date for the upcoming Cowboy Bebop Remix - September 13th. Thanks to Swordfish II for the info. 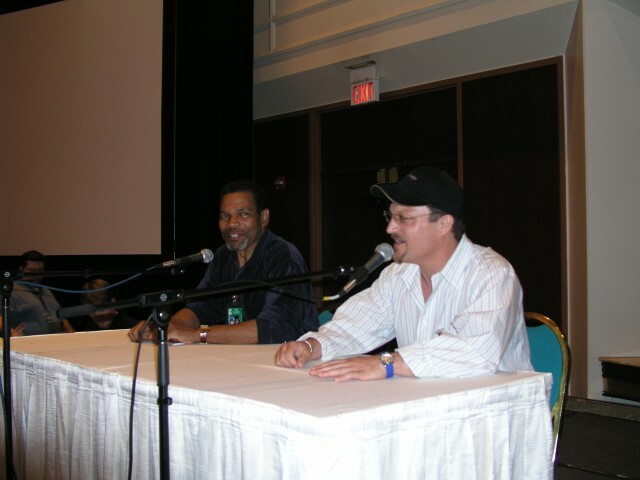 5/21/05 -- Spike and Jet at ACen. - The Anime Central blog has a short but sweet article about the appearence of voice actors Steve Blum and Beau Billingslea on a panel together at the con. Beautiful stuff, and it includes a nice picture, too. Warning: Mr. Billingslea includes a spoiler for the end of the series in his comments. 5/14/05 -- AdultSwim schedule change. - Of note is that tonight is the first iteration of a schedule change that will affect CB. From this point on, CB is not on the schedule anymore. I wouldn't worry about this too much, though; they always bring it back eventually. In it's place, AS brings us Samurai Champloo, which isn't half bad from what I've seen; also, one of it's stars is our beloved David Lucas, so it's almost like having Spike back for a second round, you know? 5/14/05 -- Can you feel the excitement, Baby? - Was there ever a webmistress that took care of her visitors as I do? Wait, don't answer that. Today, the adult's version of Santa Claus (madam mailman) brought me the artbook Toshihiro Kawamoto: Cowboy Bebop Illustrations - The Wind (which, ironically enough, I did't have mentioned on my merchandise page until today). I only had a chance to flip through it before work, but hot dog! it's beautiful. Oh yes, you will be seeing scans. 5/10/05 -- A long overdue fan art update. - I've finally added ALL the gift arts that have been sent to me. Thanks to everyone who took the time to send me their artwork, and sorry for the long wait! 5/10/05 -- So, you want to hear the vocal-less version of Dijurido they played in KoHD? - Thanks to Kief Nilsson, now you can. 5/9/05 -- Game site and KoHD for the PSP. - There's now an official site for the Cowboy Bebop game coming out in a few months. There's nothing there now except some boring Flash, but I'm sure it will be updated with more eventually. Also, did you know that KoHD was coming to the PSP on the seventeenth? 4/28/05 -- Nine-fingered Spike and the gigantical update of DOOM. - At long last I've created a real page for the Cowboy Bebop Movie! Yay! Like all the other sessions pages, it has a cast list, references, a summary, and a gallery. In addition, I've included a review, and of course I still have the KoHD news page attached. I really went crazy on the gallery - I made nearly 200 screen caps from the film. In addition to that, I've fixed every download listed on the site - now they ALL work, the AMVs, the commercials, etc. If you find one that doesn't let me know. I also did a little bit of cleaning and additions here and there. I'm planning to do more updates when I have the time. In the news, the special edition remix of Cowboy Bebop will be released this summer, according to the Anime News Network. As previously announced, it will have remastered audio and video, supervised by Watanabe. There are some other news updates, but I'll have to post them later. 10/26/04 -- The earth is mine to annihilate! - Come visit the the Chat sometime. It's on sorcery.net, channel #jazzmess. Don't let the oldbies scare you. Their bark is worse than their bite. 10/10/04 -- And babe, won't it be fine. - Fashionably late as always, I point you to the latest (relatively speaking) news of CB as discovered by Daikun on the boards - Cowboy Bebop: Ze Film will debut on Cartoon Network in the fall of 2005. The specific announcement can be found on the Adult Swim boards here (registration required). As for this site itself, I finally renewed Cowboy Bebop.org (though it still needs to be re-uploaded) and weeded the links section again, as some old favorites went under the wayside. The loss of all this information and community makes me realize just how much I want to keep this site running and useful. I really need to add a page of analysis for Knockin' on Heaven's Door, don't I? The Cowboy Bebop TV series is being re-mixed in Dolby Digital 5.1 for a new Japanese release due out on December 23rd. Previously only 6 episodes had received the 5.1 treatment, but now the entire series is getting the 5.1DD upgrade. The entire 26 episode series will be released on 7 discs and will retail for 42,000 yen (US$384). The 5.1 chanel sound remix was produced under the supervision of director Shinichiro Watanabe and original staff. Thanks to Daikun for the information. 8/1/04 -- Bebop Cola GOOOOOOD! - Some minor updates today. There were certain downloads not working, and those have been fixed. I hope you guys look over my downloads from time to time if you haven't already, because some of them are quite nifty. And in case you thought that all my MP3s were gone, I'd like to remind you that the Live DVD tracks are still up and they will remain so as long as this site remains. I also did a little weeding in my links section. In an almost-related-but-not-quite news tibit, it seems that Japan is finally starting to crack down on those Chinese bootleggers. Yay! 6/13/04 -- Late Updates King - Big Big Truck reports the guest list of AnimeFest will include two familiar Cowboy Bebop favorites. Please do not e-mail me in confusion about Spike's VA's name, or I will... er... do something mean. You'd have to be really out of the loop to have not heard about the upcoming Cowboy Bebop PS2 game, but I felt that the news of it should be somewhere on the page, even if I was too lazy to update sooner. My lack of enthusiasm on this subject has a lot to do with the fact that games based on anime rarely ever pan out to something worth playing. But let us hope, at least. 1/8/04 -- Goodbye, MP3s - I've tried for a long while to continue hosting the soundtracks to CB, but it now seems that I'm completely out of options. My latest host, Single Reel, is unable to host them. I'm actually cool with this - I don't really care that much anymore. I know you guys do, though, and I'm sorry. Even though it's a kind thought, please don't e-mail me offering hosting. Even if you think you have the capacity for all the bandwidth (which I really doubt), I just don't want to mess with it any more. The only songs I will keep up are the live DVD tracks (linked to in the Downloads section), since those are something you can't really get legally. All other dowloads will remain intact, including the music videos (which will be back up soon). 12/7/03 -- David Lucas and Steve Blum - I'm sick and tired of getting asked about these "two" actors. If you carefully examine everything on my site in regards to voice actors, you'll know the answer. I'm not going to give it to you. If you send me an e-mail asking about either actor in any respect, I'll either decide to be polite and ignore you, or I'll be rude and send you an e-mail filled with vulgarities. I'm just warning you now. Ignorance of this post is not an excuse. 11/21/03 -- MP3s and music vids currently down. - Due to server problems at Singlereel, certain downloads will be offline for an indefinite amount of time. E-mailing me about this will cause you to be ignorned. 11/17/03 -- Vive le Cowboy Bebop, part deux. - The Real Folk Blues is back. No more e-mailing me about it. :p Also, rumor has it that Cowboy Bebop: The Movie will get nominated for an Oscar. Time will tell. Thanks to faience and Daikun for the news. 11/6/03 -- Vive le Cowboy Bebop! - In this world of slowly diminishing Bebop websites, it's nice to know that at least one has reopened. BBT was good enough to point out the triumphant return of LOVIN's Cowboy Bebop site. It's in Japanese, but you need to check out that fan art. Moreover, there are now official Bebop sites for Italy and France. 11/5/03 -- Why must we always hurt the ones we love?! BANJOOOOO! - sigh. Another Bebop site gets taken down. The lovely Asteroid Blues is gone from the web as we know it. 11/03/03 -- Mooch the night away. - The albums available for download this month are the movie soundtrack, Ask DNA, and the Cowgirl Ed OST. I also want to point out something I failed to before: the live DVD tracks stay up continuously, they aren't part of the "rotation." 10/26/03 -- For Science. - It seems that my problems are not copyright in nature, but are instead bandwidth related. I had hoped by moving to Singlereel that I would be able to avoid this problem. Fat chance. ^^; The only way I can deal with it is by rotating the downloads of the various albums on a monthly basis. For the rest of October, the album is: the CD box set (only the previously unreleased tracks). 10/29/03 - He's so brave. He's so brave. He'll be her love slave. - Completely off the topic of my site, but: Tonight, watch Cartoon Network at 12:00am EST/PST, 11:00am CST. There you will find a strange, curious, and ultra cool show called FLCL. Don't worry if it doesn't make sense, just sit back and let the tingling sensation do it's work. 10/26/03 - For Science. - It seems that my problems are not copyright in nature, but are instead bandwidth related. I had hoped by moving to Singlereel that I would be able to avoid this problem. Fat chance. ^^; The only way I can deal with it is by rotating the downloads of the various albums on a monthly basis. For the rest of October, the album is: the CD box set (only the previously unreleased tracks). 10/23/03 -- All downloads back in action. - Whatever the problem was before, it's worked out now. All the MP3s and video downloads should be working. 10/20/03 -- Hmm... maybe not. - I think I have the MP3 problem worked out with my ISP. Apparently the worry was about Sony, who has the rights to the Bebop movie. Seems a little roundabout and odd to me, but what do I know? At any rate, the MP3s ought to be back up soon. Maybe. Thank you all for your support. "A RIAA internet search traced the music files you have posted using your acount with us. They have asked our ISP to freeze the account until this matter is dealt with." This is the first time I've had to deal with this particular problem. I'm not sure if it's due to my ISP or if it's just a sign of how rabid the RIAA has become. Either way, no more MP3s. Sorry again. The music videos will still remain, and I'll add more of them if I find some that I like enough to host. 10/11/03 -- For your viewing pleasure. - I've finally been able to add a section that I wanted to for some time - music videos. After asking the artists' consent, I'm now hosting what I consider to be the best Cowboy Bebop videos on the web. The AMV section can be found by going to the downloads page. Hope you like them. 10/6/03 -- Let the good shine. - The MP3s are back, baby. Yes, you read that right. Thanks to Singlereel.com, I actually have a place to put them. They won't be there long if they get abused, however. Therefore, do both of us a favor and please do not directly link to the MP3 files. Period. If you're on a message board and want people to know about a song, link to the HTML page for the song instead. The same goes if you have a website. Also, if you piss and moan that the MP3s are encoded at FM radio quality, I'll have a jolly laugh at your expense. These sound files were never intended to replace the CDs; they are here only as a sampling to allow you to decide which CD(s) you want to buy. In other news, a member of the Bebop Boards posted this site, and I must say that I admire the analysis. It's very well written, interesting and entertaining. To be honest I'm a little jealous. :3 Be sure to check it out. 9/21/03 -- Happy Birthday Jazz Mess - It's been two years to the day since this site was launched. Here's to you guys for keeping it going. Sorry, no door prizes this year. 9/1/03 -- Adult Swim expansion. According to Animation Insider, Adult Swim will be expanding it's Sunday block to six hours, with an encore presentation of it's programming. This is terrific news for night owls like myself who work late. Not so good for those of you who need to get to bed early, but still a boon in my opinion. Two Cowboy Bebops a day is not a bad thing. :) There's no mention of whether the regular weekly block will also be expanded. 7/16/03 -- Plagiarism where it should not be. - One finds bebop news in the most unexpected places. I was browsing the site of a plushie artist that I admire, when I came across an interesting and disturbing news story. As much as I've wanted one of Hatsuko Mitsumori's Ed and Ein plushies, I'm going to opress the urge to buy this knock off. In the interests of not promoting plagarism, I hope you do the same. 6/18/03 -- Cowboy Bebop movie DVD - The movie DVD is just about to be released (June 24), and I'm sure you've all got your preorders in. Interestingly, I preordered the disk from Deep Discount DVD, and they've already shipped it. It won't arrive before the street date - it'll probably arrive right on the day of - but I thought it was a nice gesture. The real news for today is that Sony has released clips of some of the extras on the disk. You can find the complete story (and the clips) here, care of ANN. 6/12/03 -- Long time, no update. - I'm a lazy bum, aren't I? Well, in all honest there really hasn't been that much to update, but there were a few things and I should have kept on it. My apologies. First of all, as many of you know, June 12th is the last day that Cowboy Bebop will be on Adult Swim at this point. We do know that at some point in the future Adult Swim will play the Cowboy Bebop movie, so this removal needn't be permanent. Also of interest: the Animatrix came out recently, and on it were some profiles of each of the individual creators. Watanabe's profile included scenes from Cowboy Bebop. Finally, don't forget to preorder your copy of Cowboy Bebop: The Movie (aka Knockin' on Heaven's Door). Preorder it now from Amazon.com or your retailer of choice. That's all I've got for now. I'll try and be more punctual in the future.